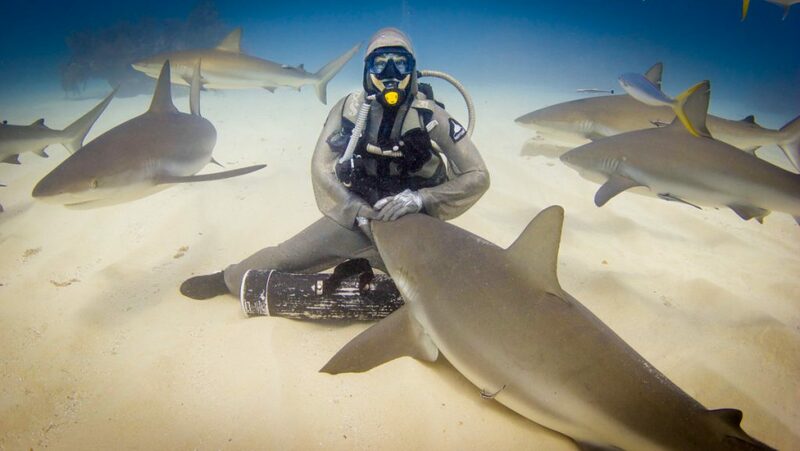 I had a dream: I wanted to become an underwater scuba ranger with sharks as friends, I would roam the oceans, work underwater to protect all the creatures and reef from the abuse of humans. A series of choices brought me to the Bahamas to learn how to scuba dive in 1994. I never left, made the Bahamas my home and scuba diving my life. I discovered I had a combined passion for sharks, oceans, and caves. Working with sharks daily made me realize how misunderstood they were and made me decide to become their advocate. 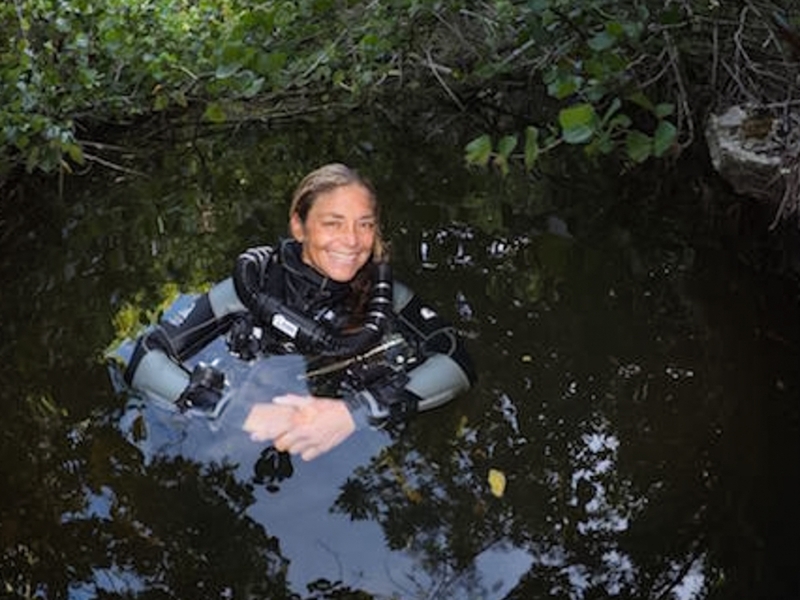 In 1996 I discovered cave diving; later I became one of the leading explorers in the Bahamas and I currently use my work in the caves to promote their conservation together with the areas around and above them, including mangroves, pine tree forests, and ecosystems. My passion and work are teaching both above and below the water. I continue to learn and grow so I can always have something new to share and inspire others with. My students come from all over the world to learn about sharks, caves, professional diving life, and conservation. I dedicate of a lot my time and work to support the Bahamas National Trust, Our World Underwater Scholarship Society and a local training program to introduce young Bahamians to the world and profession of diving and marine science. I live with three giant rescue dogs of the misunderstood kind, shelves full of books and no TV and one foot underwater and one ready to travel somewhere. Sometimes men and sometimes surprisingly women tried to stop me from doing what I wanted to do, not in a direct way but through judgment and comments. The most common ones were “this is not a job for a woman” followed by the perceived compliment “not bad for being done by a woman” to “I am surprised you are a woman” or the most excruciating one “well you have achieved that because you are a woman and that makes things easier for you” I never listened, not even when people told me that the life I had chosen was not ideal for a woman, was bringing me nothing, no security for the future nor financial stability. I quickly realized that I had to stick to my values not the ones of others. My life is full of connections, memories and moments rather than things; it is full of legacies as I watch those I have been able to support, educate or simply inspire grow in their lives and goals. It is very hard to find one emotional moment from my work; my work is punctuated with emotional moments. They include the time I saw an octopus I had been monitoring for weeks giving birth in the middle of the night dive when I went to check up on her and I found myself engulfed in the hatchlings, and then when a month later I was on the same spot and was taking images and this little 3 inches octopus went crossing the sand, I knew exactly when it has been born, or when Secret Agent the grouper understood my hand signals and waited for me to give her the next one before moving, or when I was able to reach deep into the mouth of one of my sharks and remove an embedded hook and she changed and started to want to be pet by me on every dive when before she was unapproachable. What about the look of marvel and joy in the eyes of each person I have introduced to sharks or the first time I found a new tunnel and realized I was alone walking on my moon on this unique planet, or when children send me images of sharks and they write me letters about wanting to protect them, or women write they are inspired and empowered to follow their dreams because they see me following mine, the pictures, the notes, the hellos and thank you, the generosity of complete strangers, the support of other amazing women, the calm happiness I see in my parents. We all want to do our part to protect what we love, but at times it can feel very overwhelming and impossible to attain. That’s the reason why I believe we can all be “star-throwers” and make the difference for at least just that one. (If you never read the story of the Star Thrower, do it, it’s worth those few minutes). I receive a lot of requests on how to help protecting sharks and oceans. Many feel they have to be doing a direct work, but it’s not necessarily true. We can all start from where we are. through personal choices. When possible I always recommend the three basics: reduce, reuse, recycle. Shop at local markets, bring your own canvas bags to the stores, travel with your mug and water bottle. Eat at places that use proper dinner plates and cutlery, personally I refuse to eat at any fast food chains and even regular chains in general. Bring your own take away container if you think you might not finish your dinner, remind the waiter you don’t want a straw. You can expand that with the consideration of your food choices. If you elect to eat fish, make sure it comes from sustainable and local sources. Use the very good list from SeaFoodWatch http://www.seafoodwatch.org/ You can also start looking into what are the local laws in relation to sharks and their use. What is in place where you live? Are sharks protected? Are sharks derived products allowed? What can we do to change that legislation? These are few of the ideas, I also would add, pick up the trash you find on your way and when you have the chance try to convince your local favorite place to drop the straw or to drop the plastic, always in a nice way. You will be surprised how many will be willing to give it a try. 1. Never miss an opportunity to learn, grow, through taking courses, volunteering, interning; think about growing professionally not only vertically but also horizontally. The outcome might not be immediately evident but experience is experience and it is always valuable. It can always open new opportunities. 2. Surround yourself with empowering people, learn, grow, discover and never forget to be thankful, it takes a tribe to make who we are. To be an animal would be an incredible opportunity but when I think of being an animal in this human world I am scared to be any of them. As strange as it may sound, I would love to be a gorilla, a strong and intelligent animal with a deep understanding of the relationship between nature and my place in it. I would travel in the forest, jumping from tree to tree in a structured tribe while remaining vegetarian. Let’s face it, I could never be a shark, that would require for me to eat fish and I honestly I could never do that!